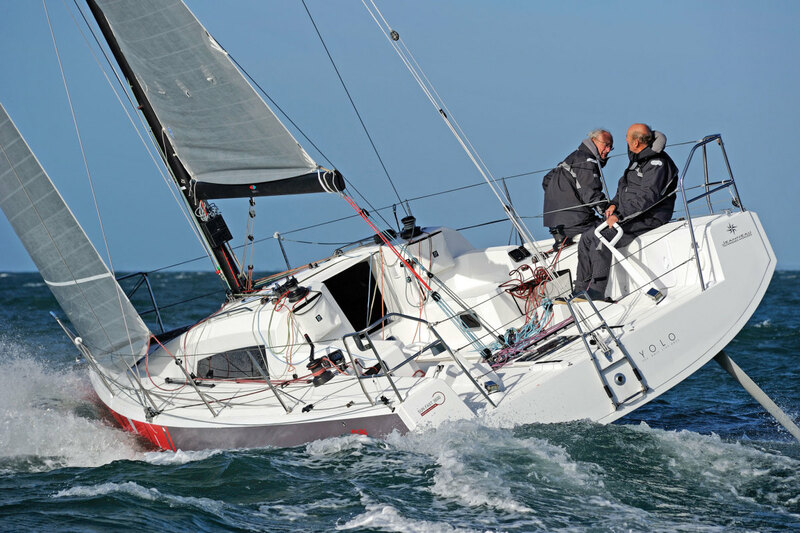 It’s been written before that sailboats are the stuff of dreams, and few designs support that contention better than the Jeanneau Sun Fast 3600. With its plumb bow and stern, twin rudders, low profile and powerful, wedge-shaped hull, this boat clearly has a healthy dose of Euro grand prix racer in its DNA. However, it also includes more than adequate accommodations and headroom to make life aboard far less of a trial than it is aboard a pure raceboat. Think a scaled-down Open 60 or Class 40 sloop without all that stooping and head banging as you’re preparing dinner, relaxing belowdecks or hitting the rack. The boat is also surprisingly friendly topside. On the eve of a delivery from Newport, Rhode Island, to Martha’s Vineyard for the Around Island race, I spent the night aboard on a mooring and had no problem at all getting comfortable in the cockpit while I watched the lights go down ashore. Later, when it came time to get some sleep, I had my choice of generous mirror-image quarterberths or the two settees, which serve as great sea berths. The head is forward, just aft of the forepeak, and there is a generous nav station (for a boat this size) as well as a spare but very adequate galley and saloon table. I am often skeptical when it comes to claims that a performance boat will also serve as fun coastal cruiser. But I could see gunkholing aboard the Sun Fast 3600 being a blast. That having been said, a boat like the Sun Fast 3600 is all about performance, and with its powerful 751ft² of working sail, 6ft 11in high-aspect deep keel, fixed sprit, and the option of flying either an A-sail or symmetrical spinnaker, the boat has speed to burn. The hull is infused polyester with a balsa core. The deck is also infused with a foam core, and attached to the hull on an inward-turning flange via a combination of adhesive and through bolts. There is a watertight bulkhead forward, and twin tillers come standard, with twin Jefa wheels as an option. Deck hardware is Harken. The standard mast is from Soromap, and a carbon stick is available as an option. The standard navigation package is from B&G. Despite all that power, the boat is no twitchy thoroughbred, but a well-mannered speedster that channels wind energy directly into VMG without any undue dramatics. Beating down the east end of Martha’s Vineyard in moderate seas and 12 to 15 knots of wind the boat quickly dug in, reducing her wetted surface area by lifting the windward portion of that wide, powerful stern out of the water, and began powering forward at just over 6.5 knots. 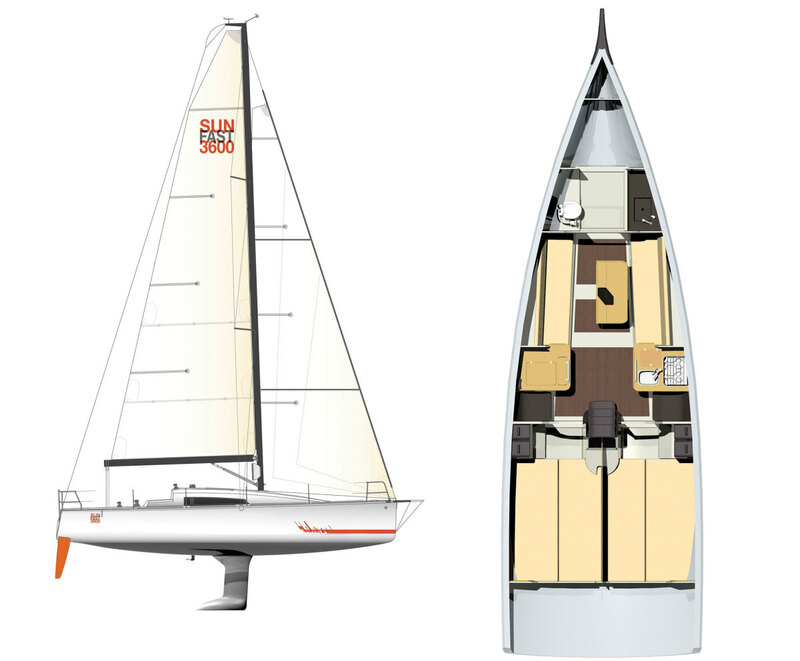 Beyond that, the deck layout is such that the boat works equally well when sailing singlehanded, double-handed or with a full crew. For our race we had six aboard and there was room for all. I’d love to try going offshore doublehanded or all alone. Maybe next time.